This video is often presented as capturing a remarkable piece of water sculpture on display in Japan. In fact, this clip actually features a piece of digital art created by Chad Knight. A common misconception with Knight’s work might be that he draws inspiration from science fiction or supernatural beings. Despite their spine-tingling appearance, his art is very grounded in reality, drawing inspiration from everyday life experiences and commonly explored concepts. The video demonstrates the creation of fake milk when it shows a brown liquid turn milky white in the presence of water. According to a reliable source: The only evidence providing support for the suggestion that the final product was “milk” was that the solution was white and opaque. Such a description can apply to myriad other chemical concoctions, however, so there is no reason to assume that a milk substitute beverage is what is seen being created in the clip. Therefore, based on the color of the chemical added, it is likely that brown liquid is the antiseptic liquid formulation of Dettol, an internationally popular line of cleaning and first-aid products with the active ingredient of chloroxylenol. Their antiseptic liquid solution is stored as a brown oil prior to being diluted with water, after which it turns milky white. This fact is a major part of the company’s marketing imagery. It is included in this commercial for the product designed for the same Kenyan audience whom the Facebook video is purportedly directed towards. Why Dettol liquid becomes Milky when treated with water? The active ingredient in Dettol is chloroxylenol which is a phenol. Phenols has very low solubility in water. When you add Dettol to water, the chloroxylenol being an organic liquid immiscible with water forms an emulsion and appears white. Actual dairy milk, it bears mentioning, is white for the same reason as the liquid in the video: an emulsion. In the case of actual milk, the emulsion contains butterfat globules and water, not Dettol and water. The notion that a pig’s lack of functional sweat glands has anything to do with its risk of transmitting disease is without scientific basis, though several posts that have gained widespread attention online have claimed that pigs are more likely to harbor dangerous bacteria and parasites because they do not sweat, making them unhealthy to eat. Origin: Pork has a long history of being maligned as an unhealthy and unclean meat primarily due to beliefs expressed in ancient religious texts, while in the modern era some armchair scientists have attempted to provide scientific explanations for the same belief. In the latter category, scientists have claimed that pigs are more likely to harbor dangerous bacteria and parasites because they do not sweat. It is accurate to say that pigs do not sweat. 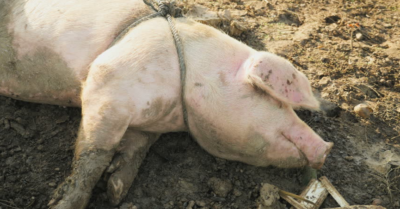 Although pigs possess some sweat glands, they do not respond to thermoregulatory cues, which is one reason why pigs wallow about in mud to cool themselves. A pig’s lack of functional sweat glands might be a compelling argument about pork’s being an unsafe food if the same thing were not also true of other animals which we eat as well. The body does appear to sweat out toxic materials — heavy metals and bisphenol A (BPA), a chemical found in plastics, for instance, have been detected in sweat. But there is no evidence that sweating out such toxins improves health … The concentration of metals detected in sweat are extremely low. Sweat is 99 percent water. The liver and kidneys remove far more toxins than sweat glands. Pigs also have a liver and a kidney, both of which serve to remove “toxins” from their body. The amount of metals or other toxins that would theoretically be removed from a pig by sweating are negligible, and therefore a pig’s lack of sweat is entirely unrelated to its potential “toxin” load. When Ascaris suum eggs are ingested, the larvae hatch in the intestine, penetrate the wall, and enter the portal circulation. After a short period in the liver, they are carried by the circulation to the lungs, where they pass through the capillaries into the alveolar spaces [in the lungs]. Approximately 9–10 days after ingestion, the larvae pass up the bronchial tree, are swallowed, and return to the small intestine by ~10–15 days after infection, where they mature into adult worms. Those adult worms, with a diameter of around 2-4 millimetres, would be roughly 10,000 times wider than a human sweat gland, which are roughly 30-50 µm wide. All livestock, regardless of species, are susceptible to similar parasites, including cows. Pork like any other food is subject to the risk of infection by parasites or bacteria, and could in theory contain heavy metals introduced by the environment in which the animal was raised. Sanitary farming conditions, proper feeding, and prudent food preparation, not sweat glands, are the means of reducing those risks. It is true that the latitude 29.9792458 N intersects the Great Pyramid of Giza (at the selected longitude of around 31. 134667 E ) . Firstly, if a point of latitude’s merely crossing a structure at any point is the bar to meet for revealing a hidden meaning to its location, then the latitudes between 29.980150 and 29.978150 (all of which intersect the same pyramid) also fit the bill, leaving a coincidence-monger roughly 2,000 numerical latitude formulations to choose from with respect to the Great Pyramid of Giza. 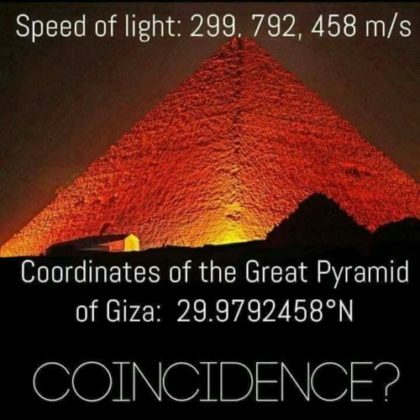 Second, if the apex of the pyramid were meant to represent an homage to the fundamental laws of the universe, the correct latitude would actually be closer to 29.9791750 N, which would bear less resemblance to the speed of light in a vacuum expressed in meters per second. Third, although the Great Pyramid of Giza was constructed around 2550 BC, the notion that light “travelled” at all (though discussed theoretically in ancient Greek times and by early Arab scholars) was not firmly established until the first estimate of the speed of light was made in 1676. Fourth, the unit of measurement on which the speed of light is based in this meme — meters — was not defined until 1771, making it a highly anachronistic one for the ancient Egyptians to have been referencing. Fifth, Egyptians of that time would have been more likely to express such a theoretical concept as the speed of light in “cubits” per second. Using 0.525 m as the estimated length of one ancient Egyptian cubit puts the speed of light at 571,033,253 cubits per second. Converting this number into latitude expressed in decimal degrees via the same approach would require the pyramid to be somewhere in western Russia in order for its location to correspond to the speed of light. Sixth, our system of referencing locations on the globe via latitude did not come into being until long after the construction of the Great Pyramid of Giza. And decimal degree mapping at the level of precision implied by the meme relies upon exacting measurements of our globe that were not possible until the late 1900s. The latitude of the pyramid in decimal degrees can match a sequence of numbers expressing the speed of light if you look hard enough for it, but that phenomenon is nothing more than coincidence. All in all, this “coincidence” depends upon people who lived thousands of years ago having knowledge of concepts that were not discovered or created until much, much later in human history, and referencing systems of measurement that did not exist in their time and place. Images and videos of the shoebill stork, a large African bird, which went viral are often met with skepticism. In short, the video shows a real animal called the Shoebill Stork. 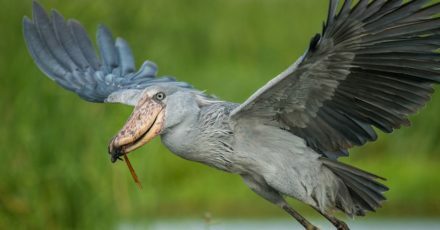 The shoebill stork is also known as the whalehead stork. The fact is Shoebills are large birds that can grow to nearly 1.52 meters tall. They primarily live in tropical locations in central Africa, such as Sudan, Uganda, and Zambia. The bird, which is listed as “vulnerable” by the International Union for Conservation of Nature and Natural Resources, subsists on a diet of eel, lizards, snakes, baby crocodiles and lungfish. Besides, being gigantic, looks like footwear, and can decapitate crocodiles. It can makes awesome machine-gun noises. Shoebills are silent most of the time but engage in “bill-clattering” around the nest or when greeting another bird. It is loud and scary and the last sound that lots of poor monitor lizards ever hear.